Production Summary: All twelve songs were written and recorded specifically for this album. In fact, the album's release date was announced before the parodies and polka were even recorded and mixed. Tour Status: As of this update, 67% of this album has been included in a regular tour setlist. The group on the cover includes Al's wife Suzanne (in shades), Al's buddy Joel Miller (in scrubs), and Al's poodle Bela (showing her legs...err, I mean, on top of Al's head), among many others. 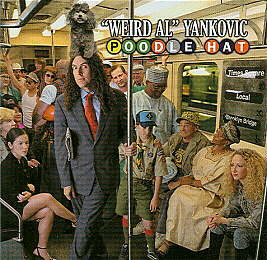 At the time of its release, the span between Running With Scissors and Poodle Hat marked the longest wait between ALbums: 1,421 days, just forty days short of four whole years. That record would be broken in 2011 with the release of Alpocalypse after nearly a five-year wait. The cover is themed around the New York City subway system, with the title lettering being comprised of the logos for the individual NYC subway lines. However, not every letter in the alphabet represents an actual subway line, so some of the letter logos had to be newly created for the title. Also, there is no one direct line from Times Square to the Brooklyn Bridge. This is the first album in which the player credits are dispersed among each song instead of presented all together...hmm, not a bad idea, huh? The CD includes a Quicktime program that plays the lyrics with the songs, offers eight special bonus mixes (see above), and a movie program of Al hosting his actual home movies. Features Al's first two parodies of artists born after the December 1979 release of the "My Bologna" single: Avril Lavigne (born September 27, 1984) and Backstreet Boys member Nick Carter (born January 28, 1980). Features Al's first released Billy Joel parody...after only 23 years of doing concert-only or unreleased parodies. The first album to not have a music video for its lead-off song, as per Eminem's stipulation for granting Al permission for the parody. Eminem's conditions also prevented "Couch Potato" from being released to radio stations as a single, thus also marking the first time an ALbum has been completely single-less. A quickie ostensible video would be produced for "Bob" as a part of that year's Al-TV special. Despite there not being a single released to promote the album, in January 2007 "eBay" hit Billboard's "Bubbling Under Hot 100" singles chart at #15 (in other words, #115 overall on the "Hot 100") solely due to sales on iTunes. Though this wasn't the first time a non-single Al song would chart (that honor belongs to "Canadian Idiot" off Straight Outta Lynwood), it does mark the longest gap between the chart debuts of a track and its corresponding ALbum: three-and-a-half years. The first album package in quite some time to not feature Doug Haverty's art direction. Debuting at #17 in Billboard with over 49 thousand copies sold in its first week, this album had the best debut of any of Al's work until 2006. It would eventually stay on the "Billboard 200" chart for fifteen weeks. Released in Australia on June 6, 2003 and in the United Kingdom on July 28, 2003. The success of the album in Australia would lead to Al's first tour in the country that fall. Became the first Al project since 1993's "Jurassic Park" video to be nominated for a Grammy, due to the changing back of the Spoken Word Comedy category to simply Comedy. In February 2004 the album would deliver Al his long-awaited third Grammy Award. 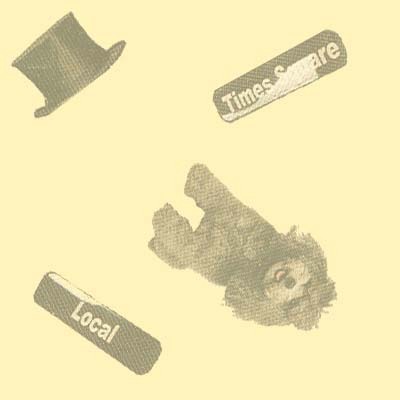 Poodle Hat ©2003 Way Moby/Volcano Entertainment III.